High flexibility by built-in PLC: The FR-A846 is easy to program with Mitsubishi Electric standard PLC software, which is available in FR Confiurator2. It is also possible to combine the PLC program with the Real time clock of the LU-08 operation panel. Energy saving by 24 V control power supply: By connecting an external 24 V DC control power supply, the system can be operated even when the main power supply is turned off. 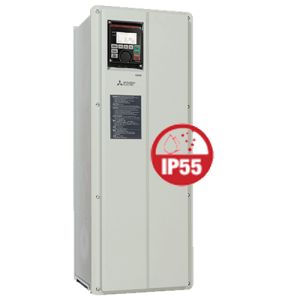 Furthermore parameters can be set and network communication can be maintained with this power supply which facilitates safe maintenance. More energy saving can be achieved by using the automatic “stand by” function which switches off the drive main power supply. Capacitors and other devices are offline, so heat loss is reduced. Improved system safety: The FR-A800 series has a two channel emergency stop for safe shutdown. This ensures safe operation in compliance with the European Machinery Directive without installation of another contactor. The FR-A846 thus conforms to the EN ISO13849-1/PLd cat. 3, EN 61508 and EN 61800-5-2 SIL2 standards. Easy operation: The operation panel with the one touch Digital Dial allows direct access to all important parameters. Select the operation panel ideal for your needs. Choose either a LU operation panel with an LCD screen offering enhanced display functionality and a clock function, or a more economical DU operation panel with a 5-digit, 12-segment display. The FR-A846 series also allows the connection of a Mitsubishi Electric graphical operation terminal (GOT). Communication parameters for the HMI connection are automatically set as a batch. The GOT provides operators with an easy-to-follow and intuitively high resolution display and facilitates easy operation via a touch panel. Designed for unparalleled drive precision, speed control, simple startup, and versatility, Mitsubishi Electric has developed a new generation of drive technology: the remarkable FR-A846. This new drive series is the successor of the highly successful FR-A700 series. It is equipped with the new state-of-the-art high-speed processor by Mitsubishi Electric. With better than ever control performance and response level, safe and accurate operation is assured in a diverse range of applications. Some of the outstanding features are the integrated USB port for programming and parameter copying, an-easy to-read control panel, optimum power usage and energy saving functions, improved system safety, three expansion slots for a range of option and supported network cards.With its impressive versatility to meet equipment system needs ranging from machining and molding to winding, the FR-A846 is an extremely economical and highly-versatile solution for a wide range of applications. The FR-A846 is a new design concept from Mitsubishi to offer outstanding performance in decentralised or harsh environments. Parameters can be easily copied by FR Configurator2. In order to match the former machine response time, the input/output signals of the FR-A846 can be delayed.